Far less nefarious than it looks. What's the best guess as to what's going on? 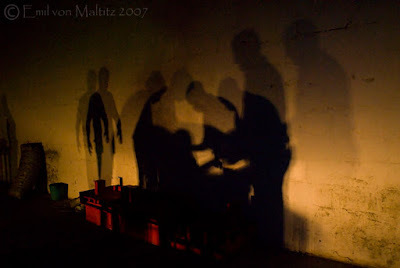 I was intrigued by the dancing shadows as a group of chefs toiled over a line of half barrel braais. The imagination can fill in interesting blanks and it becomes something out of a Hammer & Max. Possibly the red crates add to the imaginary gore... or else I've simply not been getting enough sleep lately.